We are a licensed and insured (C-39 737515) Laguna Niguel Roofing Contractor providing emergency roof repair and covering up service for all of Orange County and Laguna Niguel. If you have a skylight, chimney, fireplace, or roof that is causing interior damage to your ceiling or wall and you would like to protect your home as your insurance requires you to do we will help. 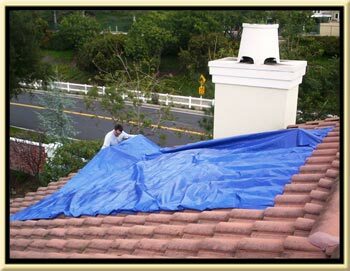 All of our emergency tarp, plastic, or repair is covered by your insurance and required by your insurance. Click the "Blue" button up top and fill out our form to get us out there right away. We will get your roof covered and save you money!